Bedside Ultrasound is a great skill to teach using online multimedia, and there are several apps available for learners at all levels. 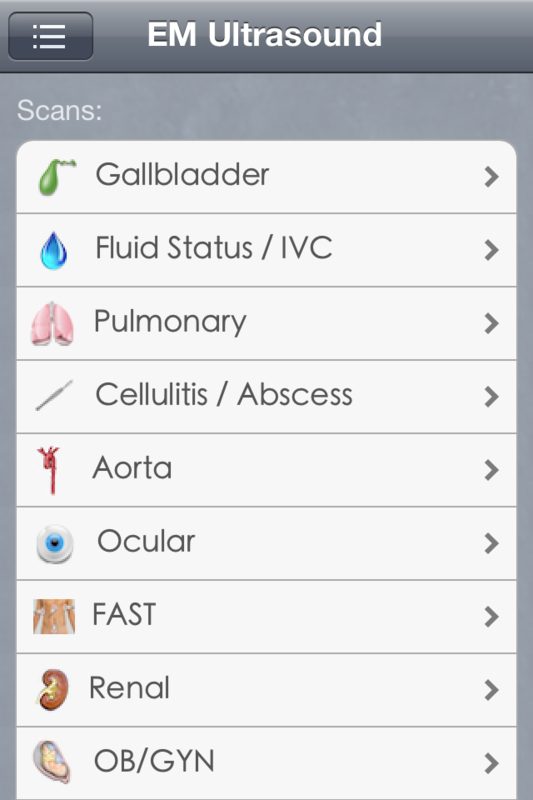 I recently reviewed One Minute Ultrasound and SonoAccess, both great free ultrasound apps. 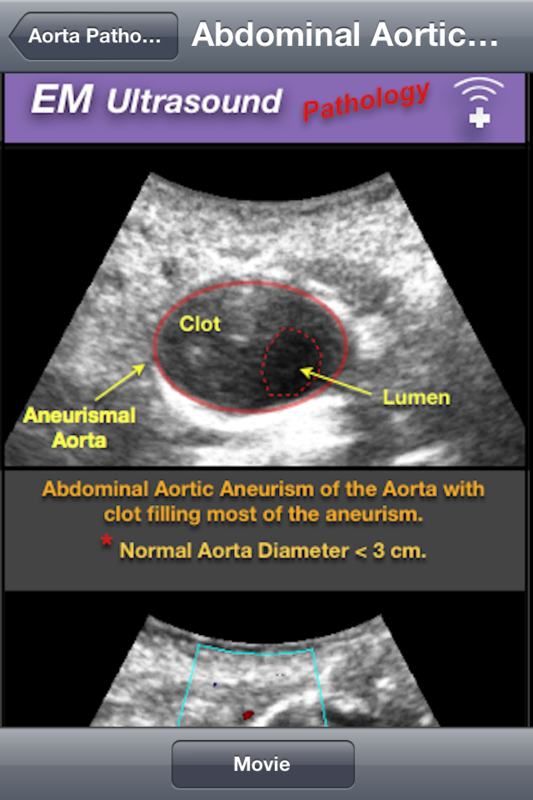 EM Ultrasound is a $4.99 app for iPhone and iPad that provides a comprehensive overview of the most common bedside scans done in the Emergency Department. 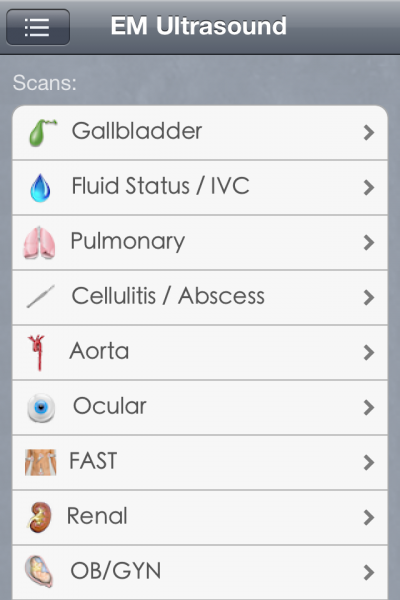 This app uses primarily static images and diagrams to review the indications, techniques, interpretation, documentation and clinical implications of several bedside ultrasounds. The initial menu screen offers a list of common Scans, in addition Dictation Template, Protocol, and Procedure menus. The user can re-organize the scans listed in the menu as they like. Each Scan contains an overview of ultrasound technique and a description of the relevant clinical context, followed by examples of normal and abnormal scans. Diagrams illustrating technique show where to place the probe on the body in order to obtain the correct views and use arrows to indicate the direction of the probe marker. Annotated ultrasound images demonstrate examples of normal scans and common pathology. Videos are available to see examples of real time scans. 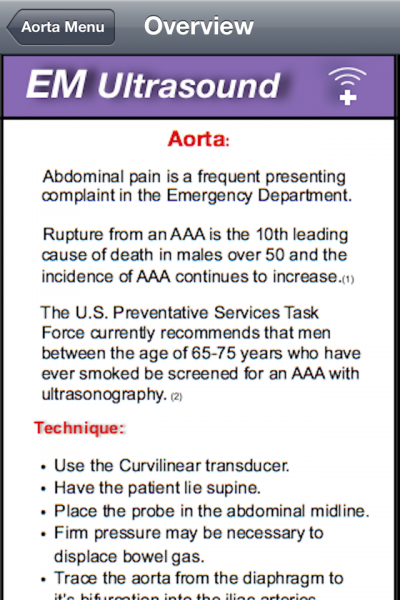 Dictation Templates provide examples of how to compose a report for different bedside ultrasound exams. The Protocol section contains suggested frameworks for using bedside ultrasound in the evaluation of specific clinical situations. 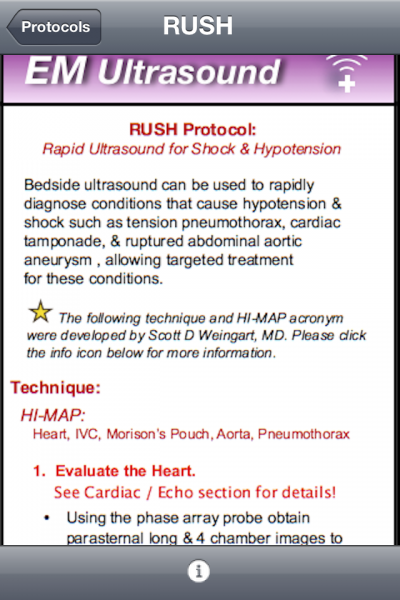 This version highlights FAST (Focused Assessment with Sonography in Trauma), RUSH (Rapid Ultrasound for Shock & Hypotension), and Respiratory Distress. 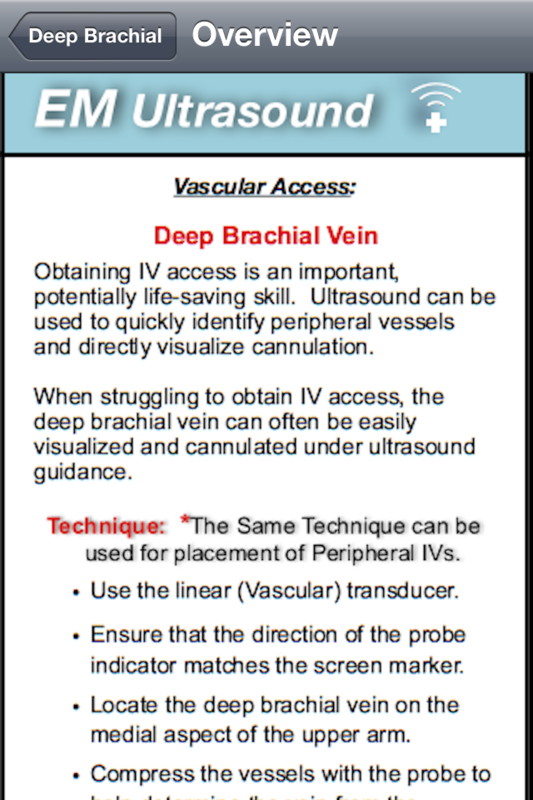 The Procedure section provides text, diagram, and video reviews on how to use ultrasound when performing cricothyrotomy, paracentesis, pericardiocentesis, thoracentesis, and vascular access. Comprehensive overview of several bedside ultrasound exams with relevant context. 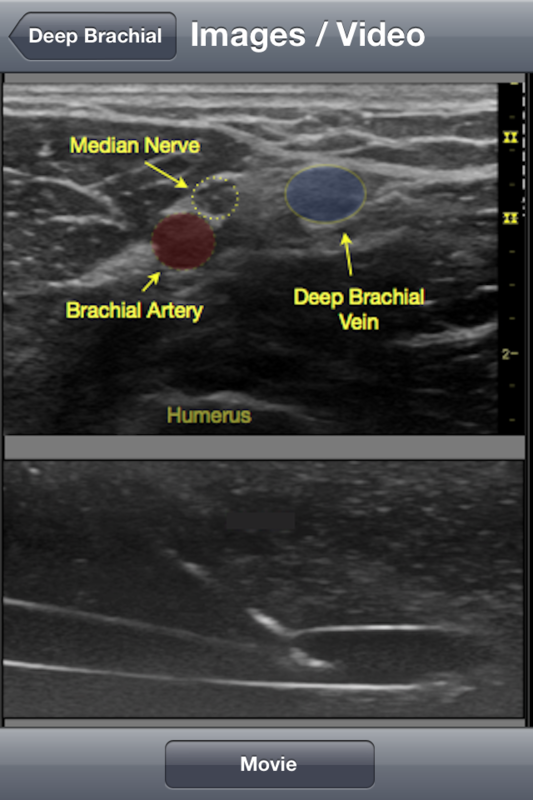 Diagrams and annotated images clarify ultrasound technique and image interpretation. 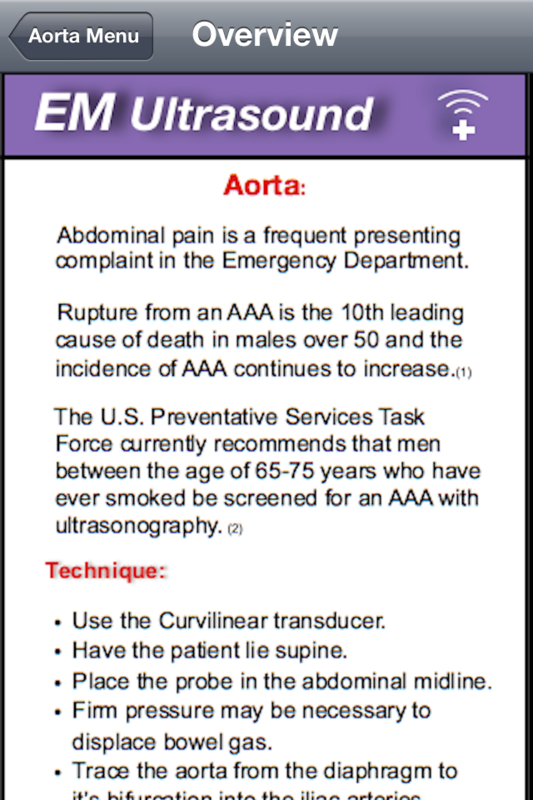 Useful for bedside teaching and review. Limited use of video to show real time scans. Images not optimized for retina display. This is not a major problem on the iPhone, but since the iPad version is merely a zoomed in version of the iPhone app, the grainy image quality is considerably limiting. Physicians, residents, medical students, physician assistants, and nurse practitioners learning and using bedside ultrasound in the Emergency Department. 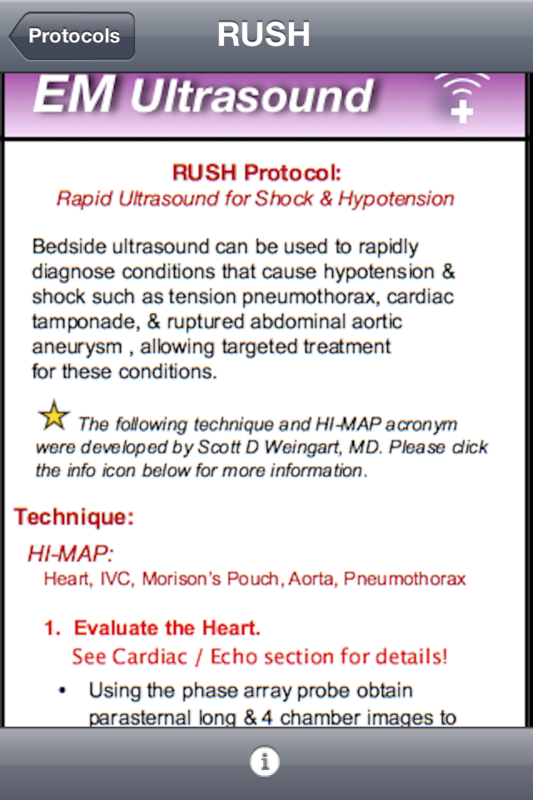 EM Ultrasound is a simple but comprehensive app that contains a wealth of information on bedside ultrasound that is easy to navigate and readily applicable at the bedside. 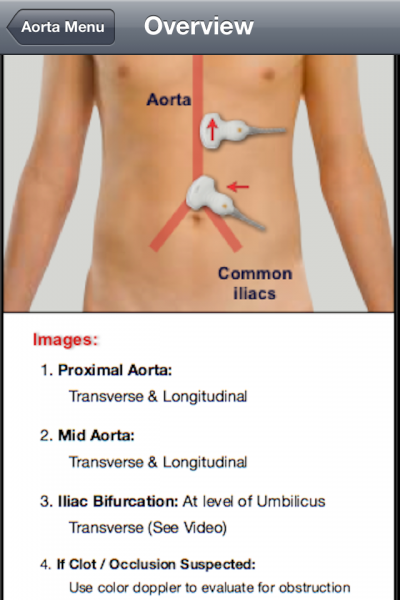 A variety of different types of multimedia provide Emergency clinicians with a comprehensive review of common scans, in addition to information about emerging applications for ultrasound. 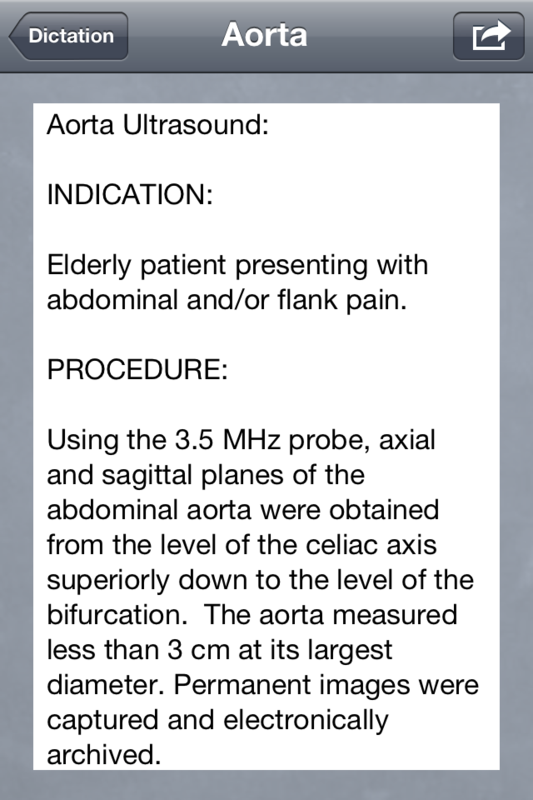 This app is appropriate for both students and residents learning ultrasound and also physicians practicing in the community. User Interface – 5 – Very straightforward and easy to navigate. Multimedia usage – 3 – Great diagrams. Would benefit from more video of real time scan videos. Need to update image quality to optimize for retina display on iPhone and iPad. Price – 4 – $4.99 – Reasonable. Real world applicability – 5 – Optimal for bedside review with practical teaching points, also useful for self study.